Why Is This Nebula So Perfectly Symmetrical? This is one of the most symmetrical nebulae we've ever seen. It was discovered in the mid-2000s by astronomer Peter Tuthill, who named it the Red Square. Its unusual shape hints at a possibly violent future for the star at its center. The image shown here combines data taken in near-infrared light (1.6 microns) and shows a region 30.8 arcseconds on a side around MWC 922. As the outer periphery of the nebula is very faint compared to the core, the image has been processed and sharpened to display the full panoply of detail and structure. "The thing that really takes your breath away is the astonishing degree of symmetry within the intricate linear forms," said Tuthill. "If you fold things across the principle diagonal axis, you get an almost perfect reflection symmetry. 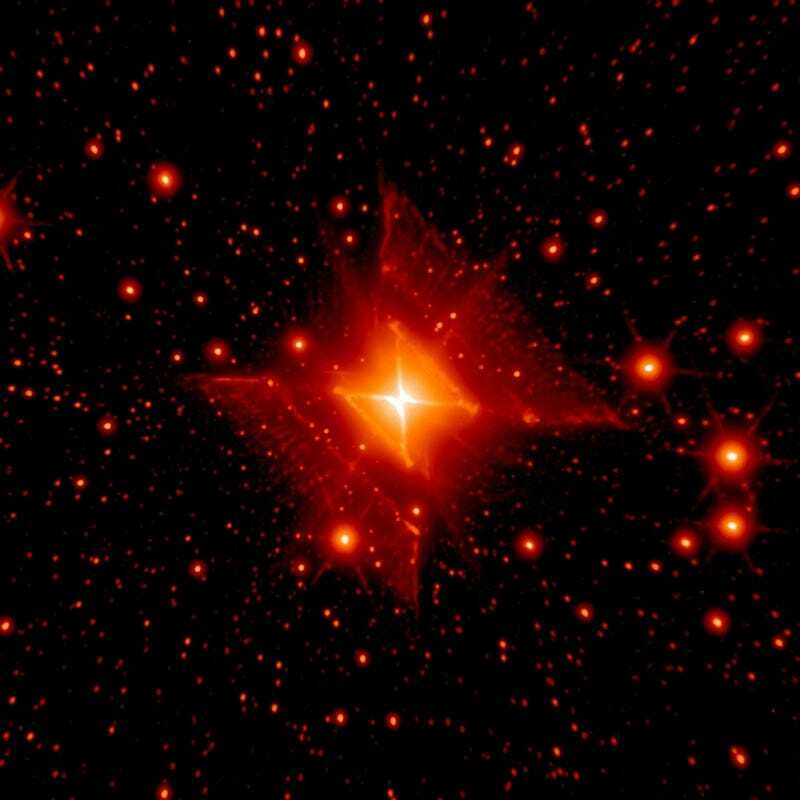 This makes the Red Square nebula the most symmetrical object of comparable complexity ever imaged." The overall architecture of twin opposed conical cavities (commonly known in astronomy as a "bipolar nebula") is seen to be adorned with a remarkable sequence of sharply defined linear rungs or bars. This series of rungs and conical surfaces lie nested, one within the next, down to the heart of the system, where the hyperbolic bicone surfaces are crossed by a dark lane running across the principle axis. One particularly fascinating feature visible in the images is a series of faint radial spokes, like teeth of a comb, pointing away from the center. "Structures such as this are rarely seen in nebulae, and the high degree of regularity in this case may point to the intriguing possibility that these bands are shadows cast by periodic ripples or waves on the surface of an inner disk close to the star at the heart of the system," said Lloyd. The structure of the nebula, Tuthill noted, could also imply that a star in it is about to go supernova. So far, in the 8 years since this image was produced, that hasn't happened yet.